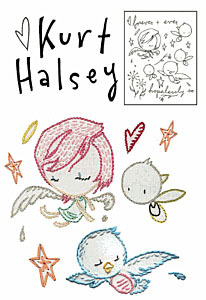 The only thing that could possibly make Kurt Halsey's illustrations any sweeter, is to embroider them. His simple but touching illustrations are perfect for embroidery! Stitch up messages of love between smitten angels, birds and bees. One 8 1/2 x 11" sheet of multi-imprinting, iron-on embroidery patterns. Just iron on to any fabric and stitch along the lines. Each pack comes with complete instructions for getting started in embroidery!